Unexamined electrical outlets and lines cause over $100 million in home and commercial fire damage every year. Almost all of these fires are completely preventable with routine maintenance. The majority are caused by common electrical components and/or rodent damage. Our Tracy electricians suggest that you check the following things at least once a month to help avoid a fire. Check Your Cords – Electrical cords are one of the biggest fire starters, especially in areas where they come into contact with carpet and fabric. All cords should be checked for cracking and fraying. Any damaged cords should be replaced immediately. You should also keep cords out of high traffic areas where people could trip over them and yank the plug from a wall outlet causing damage to the plug prongs. Read Light Bulb Wattage –Whenever you replace a bulb make sure it is the correct wattage for the socket. This is important with incandescent bulbs but also needs to be kept in mind with CFLs that are housed under lampshades. When the bulbs get too hot, they can explode and start fires. Using a bulb that uses a higher wattage can also cause an unsafe heat build-up in the wires leading to the socket and cause it to short out. Flip the Circuit Switch – Circuit breakers and fuses need to be checked periodically. If a fuse of the wrong size is placed in a breaker it could cause a host of problems from allowing too much electricity to pass through to sensitive electronics to blowing prematurely and causing power outages. In this new era of high consumption electronics, many older circuit breakers are not correctly wired for the new electric demands. If you aren’t sure what size fuse belongs in a particular slot, call in a Tracy CA electrical contractor to label your box for you. Get an Interrupter – One of the most important pieces of equipment that can be placed in a utility room, kitchen or bathroom is a GFCI (ground fault circuit interrupter). This device immediately shuts off the electrical supply if it detects water. This can prevent accidental shocks and electrocutions due to electrical devices coming in contact with water for any reason. Call us today to get a dependable electrician in Tracy on the way for an installation. Our Tracy electricians suggest that you install surge protectors on all of your major appliances and electronics to prevent damage from lightning strikes or power cycling. 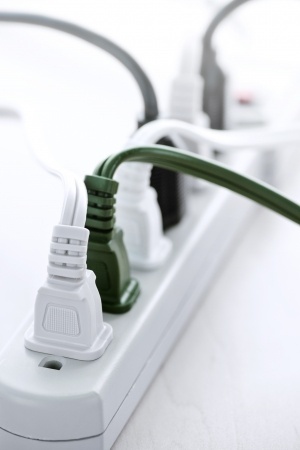 A $15 surge protector could save you from having to replace a $1000 computer or refrigerator. Should you require additional electrical services, GENTEC Electrical Services is your one stop shop. Our goal is to provide our customers with the best quality electrical work that you can rely on. We hire expert electricians and provide regular trainings so that all of our technicians are up to speed on the latest technology. Their years of experience will come in handy assessing electrical problems you might encounter. Before they leave, they will provide you with any necessary education you might need in order to prevent electrical damage. A lot of people may have the expectation that a good electrician will get the job done fast, be courteous, and have a neat looking result after they have finished an electrical repair or upgrade. To us, that is only the beginning of the type of service you will receive when choosing GENTEC Services. Our patient and caring technicians are more about working with you throughout the process so you understand exactly what they are doing and why. While we promise to be fast, our quality and attention to detail will take precedence so that end up with astonishing results in less time that you anticipated. Our technicians go through extensive training in addition to having over 8,000 hours of combined work experience and all the necessary and up to date state certifications. Our previous clients include small, family owned businesses to Fortune 500 corporations. No matter the size, you need consistent and reliable electrical performance so you can keep your business growing. We understand that you may not have the time to accommodate an electrician, which is why we do whatever we can to work within your schedule without impacting your day to day operations whenever possible. We keep in constant communication with our technicians to ensure seamless transition between different job sites. For more than 35 years, our people have seen the worst and the best when it comes to commercial electrical setups, which is why we created procedures to deliver to fastest and budget friendly service with only top notch quality. Television programs of the past set up an expectation that technology would be integrated into every aspect of our everyday life by this point in time. While we might not have a flying car yet, there are so many new technological advancements that can bring your home or business into the 21st century, with improvements happening rapidly. GENTEC Services stays up to date on the latest technology so that our customers never fall behind. Devices can now be equipped into any home or business that can make your home a state of the art technological wonder. Automated lighting controls make it so that no one will ever accidentally leave the switch turned on, resulting in an outrageous electric bill for you. These controls can also adjust based on the amount of sunlight coming into the room so you are not using any more electricity than you actually need. Plus, you can deter thieves by setting controls to create the appearance of people inside while you are away. Speaking of security, GENTEC Service can also incorporate a closed circuit TV security system into any home or business so that you can monitor your property all day and maintain footage should you need to access it later. Look no further than GENTEC Services to provide you with the most honest and professional electricians in the area. Our hold integrity, safety, and customer satisfaction in high regard and promise to always deliver in those area. You will never be nickeled and dimed into lengthy electrical jobs that seem to come up with several small problems that drive up that bill price because we charge by the job, not by the hour. You will know how much you are paying before the electrician even shows up and we will stand by the quoted price. Sometimes, problems arise and a job may need to take longer, but we do not believe that means the customer needs to pay more. Call us today at 925-373-1682, or 510-764-8848 to schedule a consultation, or fill out our online service request form.